EDWARDSVILLE – A coalition of area educators has endorsed Rachelle Aud Crowe for State Senate in the 56th District, citing her unwavering support of teachers, students and quality public education in the Metro-East. Rachelle has been endorsed by the Illinois Education Association, Illinois Federation of Teachers and the Illinois Retired Teachers Association. Since taking office, Gov. Rauner has been fixated on one thing: breaking unions in Illinois. In his first year in office, Rauner worked nonstop to force towns and villages to pass his “Turnaround Agenda,” which would have implemented local so-called “right-to-work” zones and lowered the pay of working men and women. While most local Mayors rejected the governor’s union-busting agenda, Edwardsville Mayor Hal Patton endorsed the governor’s plan. While he was ultimately unsuccessful, Patton teamed with Rauner to pass the anti-union platform. Now, Hal Patton wants to represent us in the State Senate in Springfield. Now more than ever, we need an advocate who will push back against Gov. Rauner in his attempts to weaken organized labor. EDWARDSVILLE – Law enforcement agencies from across the region have endorsed Rachelle Aud Crowe, candidate for State Senate in the 56th District, citing her experience as a prosecutor and her commitment to the men and women in blue. 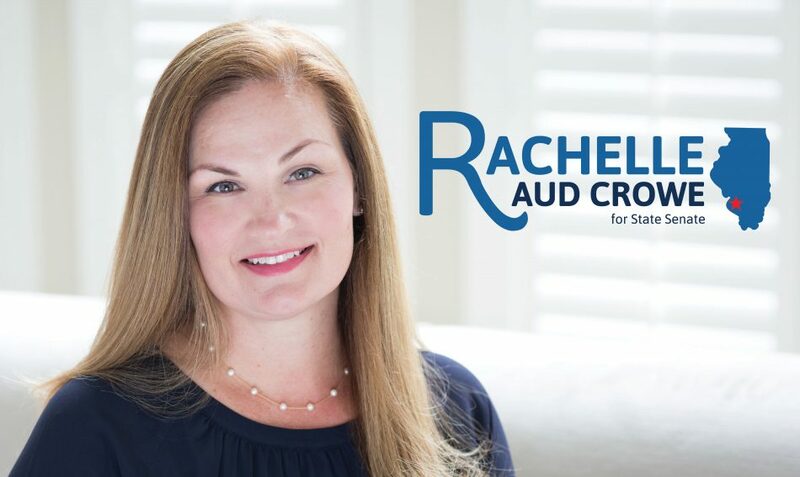 Rachelle Aud Crowe is currently an Assistant State’s Attorney in the Madison County State’s Attorney’s office where she has prosecuted murderers, child predators and violent criminals. A few weeks ago, Channel 5 highlighted how the opioid epidemic is continuing to wreak havoc across our region. Between 2013 and 2016, Illinois recorded a 70 percent jump in opioid overdose deaths. Madison and St. Clair Counties were singled out in this report as being at the center of this epidemic. We need our political leaders to understand the gravity of the situation and work to implement multi-layered solutions to this crisis. I am proud to say Rachelle Aud Crowe is one of those leaders. My campaign manager and daughter, Brynn, put together this book describing the campaign from her perspective as my daughter. Dear Editor: As a Granite City police officer, I have seen first-hand how crime can destabilize an entire neighborhood. After 20 years on the force and President of the Police Benevolent and Protective Association, I also know how important it is for our law enforcement officers to have the support of our community and our lawmakers. Rachelle Aud Crowe, running for State Senate in the 56th District, is one of those individuals. Rachelle understands the issues facing our communities and the importance of supporting the men and women who put their lives on the line every day for the safety of us all. Edwardsville – Today, Rachelle Aud Crowe, Democratic candidate for the Illinois Senate’s 56th district, announced endorsements of the State’s Attorneys from Madison, St. Clair and Jersey counties. Portions of the three counties make up the senate district she is running to represent. Aud Crowe currently serves in the Violent Crimes Division in the Madison County State’s Attorney’s office, where she has prosecuted some of the most dangerous criminals in the county. She has worked in that division since 2013. She has served with current State’s Attorney Tom Gibbons since he was appointed in 2010. State Senate candidate Rachelle Aud Crowe announced today that she has been endorsed by the Illinois AFL-CIO in the election for the 56th Illinois Senate District. The labor union represents nearly 900,000 members throughout the state. Senator Bill Haine endorsed Democratic candidate Rachelle Aud Crowe for the 56th Illinois Senate Seat. Haine has served as the district’s senator for more than 15 years and recently announced he would not be seeking another term. Visit our News page for more! Madison County prosecutor Rachelle Aud Crowe announced her candidacy in the Democratic Primary for the 56th Illinois Senate District, with a pledge to bring local values and a prosecutor’s determination to Springfield. Keep up to date with Rachelle!